I’m a couchsurfer, ( www.couchsurfing.org ) Being one means you’re a thick idiot who hosts strangers for free in your house. The deal is meant to be that after the strangers have come and emptied out your fridge, been sick on your spare bed and nicked a few books, they will also write feedback on the website saying that ur not a psycho killer and that it’s ok for other people to let you stay on their couch should you ever recover your losses and get out of the house. Then you can travel the world by asking people if you can stay on their sofas and they say yes because they read all these nice things about you online. I had this notion that it would be interesting to meet people from all around the world and show them Galway, but most of the visitors we got were extremely boring eastern Europeans who kept their food in a separate plastic bag and got up early to do yoga. So last week when I arrived in Berlin I wasn’t sure whether I should really go and stay in some weirdo’s house or not, but given that I was broke and on my own, the idea of talking to a grown up and not spending my life savings on two nights in a cheap hotel did become attractive. I stayed with Angie, a woman of my age (and that means the age where you stop saying your age), and her 15 year old daughter. Angie handed me a key and told me she’d be out all night. The daughter was going out somewhere too, but she’d be back. Suddenly I was glad that I was staying. It meant that Angie could stay out all night and there would be someone there to babysit the daughter. I could make myself useful. But the15 year old already had a babysitter for the night: her boyfriend. The apartment was only one stop away from the central station, but I was tired, so I strolled to the corner of the road where a convenient sidewalk pizzeria lured me in with pizzas for €3.50, the same price as the wine. 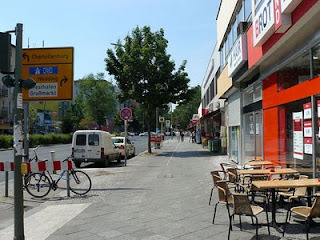 I’d spent all day seeing the sights: Potsdamer Platz, Checkpoint Charlie, the Brandenburg Gate, and I’d sat in café’s around Kreuzberg and Prenzlauer Berg. But this pizzeria on the street corner was the business. Women in burqa’s stuck their heads out of pokey apartment windows, shouting at kids playing street football in Turkish jerseys: the kind of kids who speak broken German but have never been outside Berlin. And old girl sat at a table opposite me and ordered another beer. She had the usual collection of bags full of things that should be discarded but would always weigh her down. A fat couple ordered ice creams after their dinner: massive big coupes with cream and syrup. I wanted to do the same, but I was too embarrassed to, being a fatty myself. There was one of those walk aids parked at their table, the type with wheels and a handy ledge to put shopping on. I didn’t know which of them it belonged to. Maybe they took turns. I could see my future. It wasn’t the best pizza ever, and the wine wasn’t a 1985 Barolo, but it was real Berlin. The old girl lit a cigarette. I wondered what she was thinking. I hoped nothing. People destroy themselves with thinking. A man in a turban parked his bicycle and a car drove past blaring oriental music. I could hear the waitress scream angry Italian at someone in the kitchen. A peroxide blonde with a red faced, bearded man joined the old girl with the beer. They ordered more beer, and when they sat down I noticed that the blonde had a dog in her handbag. I ordered another glass of wine and pretended to read a book. Another burqa leaned out of an upstairs window and screamed at a child. Forget my fluent German, I couldn’t understand a word and I was loving it. The heart of Berlin. A Tooth Or A Campervan?